Duffle Bags There are 21 products. 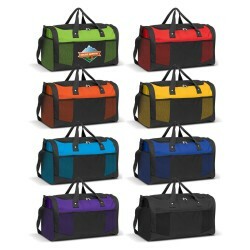 Roll duffle bag manufactured from strong 600D polyester with two external pockets. Has both carry handles and a removable padded shoulder strap. Duffle bag manufactured from 600D polyester with both carry handles and a shoulder strap. Has one 600D external pocket and three mesh pockets. Made from 600D polycanvas and diamond non-woven material. Main zippered compartment. Front main pocket and pen loop. Side mesh water bottle pocket. Permanent adjustable shoulder strap. Two carry handles. Large robust duffle bag manufactured from 600D polyester with a lower compartment for shoes. Other features include an adjustable, removable shoulder strap with a shoulder pad, zipped side pocket, two mesh pockets and carry handles with a velcro wrap. Large duffle bag manufactured from 600D polyester. Has an adjustable, removable shoulder strap with a shaped shoulder pad for maximum comfort when carrying. Other features include a sturdy reinforced base with plastic feet, three zipped external pockets and two mesh outer pockets. Stylish duffle bag manufactured from strong 600D polyester with attractive, patterned ripstop nylon accents and coloured beading. Has carry handles with a velcro wrap and a removable padded shoulder strap. Features three external compartments, one of which is an extended waterproof inner bag for shoes, boots or wet clothing. Made from 600D Polyester. Large main compartment with zippered opening. End pockets with side pouch on right hand side. Available in Blue and Grey.